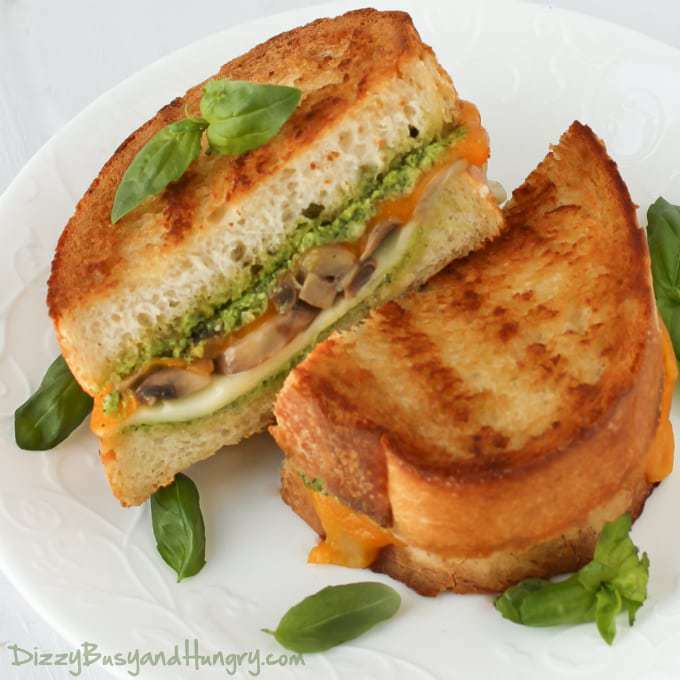 Broccoli Pesto Mushroom Grilled Cheese | Dizzy Busy and Hungry! It is no secret that I love grilled cheese. We have it for dinner often, probably 3-4 times a month. I like to play around with the cheese and other filling ingredients to change things up a bit. Interested in seeing what else I have tried? Here are a few examples of some of my other grilled cheesies: Turkey and Brie Grilled Cheese, Zingy Shrimp Grilled Cheese, Cheddar Pumpkin Grilled Cheese, and Parmesan Crusted Grilled Chicken and Cheese. This one might be my favorite so far. The kids love it, I love it, and it is easy to make, especially now that I have mastered an oven method of ‘grilling’ the sandwiches. I love just popping the sandwiches on a baking sheet and letting the oven do all the work. I used my homemade Broccoli Pesto in this grilled cheese, although you can use your own favorite pesto recipe or even store-bought. I like the Broccoli Pesto because it is just another way for me to easily get more veggie goodness into my kids! 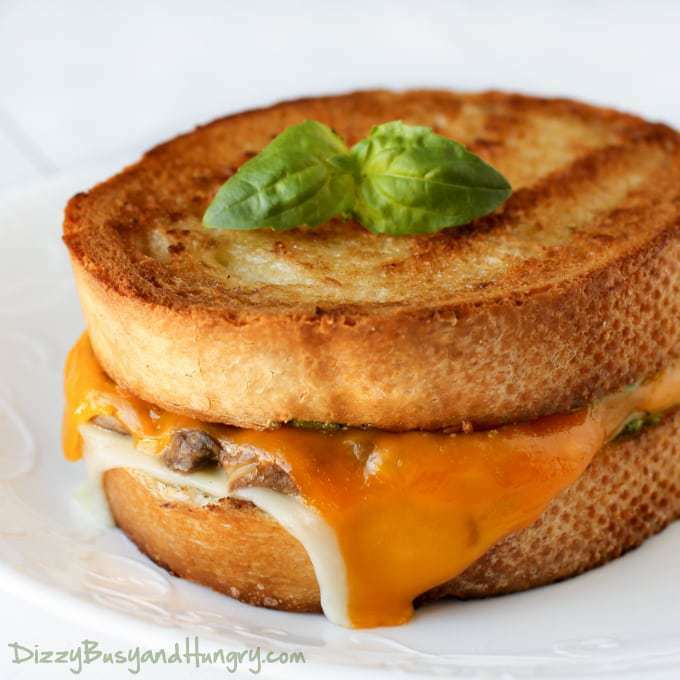 Delicious, hearty grilled cheese sandwich perfect for lunch or a quick and easy dinner! Spray a medium skillet with olive oil spray, then add the onion and mushrooms and saute until the onions are slightly translucent and the mushrooms are softened. Set aside. Butter one side of each of the 8 slices of bread with the butter. Place 4 of the slices on a baking sheet, buttered side down. 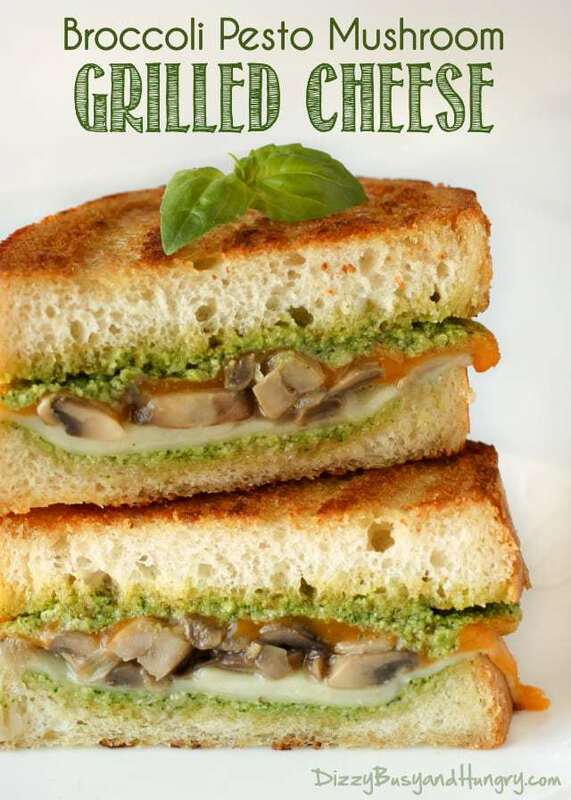 Spread a generous tablespoon of pesto on each of these 4 slices of bread, then layer with a slice of mild cheddar, then 1/4 of the mushroom mixture, then top with 1 slice of mozzarella. On the remaining 4 slices of bread, spread the non-buttered side with a tablespoon of pesto, then place them each on top of the mozzarella, buttered side up. Oh, I have to make a batch of the broccoli pesto. This sandwich looks awesome! Thanks! Definitely one of my favs! I’m back! Tomorrow my new roundup post featuring 10 great grilled sandwiches goes live and this is one of them! Kristin, this grilled cheese looks absolutely delicious. Thank you so much for sharing it and your Broccoli Pesto recipe at the home Matters Party!! 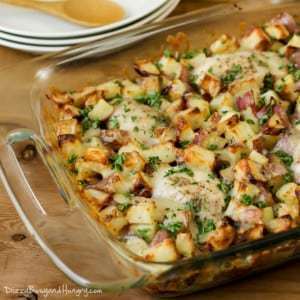 That must definitely taste so good, I’m pinning and trying it soon! oooh… you can make this sandwich for me any time at all! Wow! Pinned it to my Sandiwches board. Would love it if you would stop by my party this week to share this. We go live at 7pm EDT Tuesday nights but it is called Wonderful Wednesday Blog Hop. Be sure to let me know that you were there? 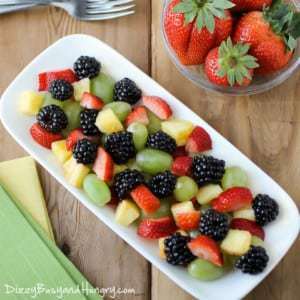 This looks Amazing and delicious! I need to try this for sure! Thanks for sharing on the #mondayfundayparty Pinning this now! Kristin, you are amazing! I am so excited to make your broccoli pesto and put it on …… everything! This grilled cheese sandwich looks wonderful. I am so hungry now, (late dinner) and I wish I could snap my finger and eat anything you have made. Thanks so much. Bernadette, you are so sweet, thanks for your kind words, you made my day! This grilled cheese is definitely one of my favorites, I hope you are able to adapt it so you can try it! 🙂 Have a great day! No cheddar in Rome?!? How interesting, I never knew that! I bet they have great mozzarella there, though. And probably a bunch of other great cheeses too! Love a good grilled cheese! This looks really delicious!! I’ve gotten so many grilled cheese recipes already this month! I’m loving them! this one looks fabulous! Oh my goodness! This is an amazing combination. Each layer looks delicious and the bread is grilled so perfectly. I LOVE adding pesto to sandwiches! Will have to try the mushroom and cheese.